The flight behavior of multirotor systems and their reactivity and interactivity with pilot or control software is researched as part of the scientific field of flight dynamics and simulation. /// Compensating failure & improve resistance. Operating errors – e.g. pilot failure – or malfunctions of individual components or engines are to be largely controlled and compensated for at the best possible rate. Robustness against extreme environmental and weather conditions such as wind, turbulences or icing is one of the objectives of this research. Flight procedures: Interpretation, definition and evaluation of missions and flight procedures for environmentally friendly and sustainable flights according to pre-defined framework conditions such as safety, flight capability, economic efficiency and noise reduction. Flight automation: In order to raise the levels of safety and efficiency, the pilot shall be crucially supported by an intelligent control system (autopilot) in all navigational tasks. Flight mechanics: In consideration of specific operational limits and atmospheric influences, the motion behavior of the flight system is assessed on basis of measurement and simulation data. Possible aspects: Flight performances, flight characteristics, controllability, noise and emissions as well as regulatory approval procedures. Simulation technology: Procurement of competence regarding the development and operation of real-time simulators, development of new software and hardware concepts, development and use of visualization technology for displays and virtual exterior view. Implementation of man-machine-studies to assess control elements and usability. Modeling and simulation: This research field comprises the development of databases for training simulators, the design of models for system controls and assessments or chaperoning and validating practical tests. Mathematical models and formulas are used to improve partial systems such as propulsion, engines or propellers. Test flights are planned, carried out and analyzed. Cognetics: Human perceptive skills are in the focus of this research field – e.g. visual perception or motion perception. 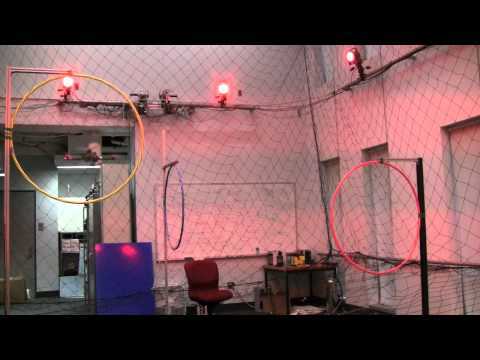 Cognetics research the dynamic interaction between humans and aerial vehicles. The efficiency of trainings and the quality of flight simulators is analyzed, and flight control functions for simplfied flying (e.g. easy flying, auto functions, error detection, reconfiguration, protection function against turbulences, gust load reduction) are developed.